Alex (now Garside nee Warren-Piper) was first introduced to real tennis at the age of 20 years when watching the men’s Unigate World Championships at Moreton Morrell. Coming from a lawn tennis and squash background, she had to have a go at real tennis and was lucky enough to be given a racket for her 21st birthday. She hasn’t looked back since - hooked on the game she put herself forward as Treasurer of the newly formed Ladies Real Tennis Association at her first tournament and then continued to enter as many competitions as possible at home and abroad (while working full time). She also continued to play lawn tennis and squash, the latter to County standard. Having started playing at Moreton Morrell, Alex secured a job at the LTA in London and continued to play real tennis at The Queen’s Club and Hampton Court. Alex met her future husband, Ian, and moved to Hayling Island joining Seacourt where she currently plays. She has two children, Michael and Jess, both of whom are keen on their sport. She leads a very busy home life and is now retired from her full time job at IBM. Alex is currently Chairman of the LRTA Executive Committee having been on the Committee since its formation in 1981. Over the many years she has been playing, she has won various singles and doubles competitions in the UK, France, Australia and US. Since taking over the Chairmanship from Sarah McGivern, Alex’s main focus is on junior development as well as ladies’ tennis in general. Lucy took up tennis whilst working in London but found that work prevented her getting much time on court. Things changed when she retired, moved to rural Hampshire and joined Petworth. Now she plays more often and with great enthusiasm - but sadly not to the benefit of her handicap! She is on the Petworth Committee and was the LRTA Representative there for a number of years. She joined the LRTA Executive Committee in 2006 and became Secretary in 2011. Her 'specialist subjects' for the LRTA are keeping an eye on Child protection issues and investigating and sourcing items for the LRTA kit - she can often be seen at tournaments persuading ladies to add to their whites wardrobe. 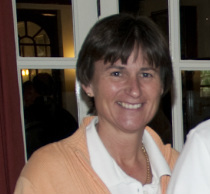 She is now the main organiser (having been Sheila Macintosh's assistant for some years) of the LRTA International Invitation tournament and also helps run the British Open and the Handicap Mixed Doubles. Katy joined the LRTA Committee in 2009 and took over as Treasurer in 2015. As well as serving on the Committee, she has particular responsibility for organising the Handicap Tournaments in the autumn and the Ladies Masters’ in the spring of each year. She also represents the LRTA on the T&RA Handicap Committee and is sitting on RT2020 – a T&RA Tennis Committee initiative to help Real Tennis clubs realise their maximum potential through collective thinking and action. It is designed to build on what already exists and one of the key issues it is trying to do is to encourage the recruitment of more women. Katy started playing Real Tennis at Holyport in the early 1990s but her main club now is Hardwick House. She has a real passion for the game and enthusing others to start playing but just wishes that she had come sooner to the game and become a better player. ​We are very sorry to report the death of Jo Iddles at home on Wednesday, 31st January 2018. Jo was a real tennis professional and was one of the top lady players in the first decade of this century having won two World Championship Doubles titles as well as being the losing World Championship Singles finalist in 2005. She was also a fine lawn tennis player and coach. Jo's funeral will be at 1.00 pm on Wednesday, 7th March 2018 at Cheltenham Crematorium. ​Another win for the LRTA team thanks to Evie Fleming's friend Chris Davies teaming up with Izzy Hunt as Evie was injured. It is with great sadness that we heard of the death of Lottie Fullerton in a landslide in Nepal. Lottie was the winner of the 2015 Girls Under 21 Handicap Singles and was a member of the current LRTA Development squad. We send our heartfelt condolences to her family and friends. Lottie's funeral will be held at St. Anne's Church, Kew Green, London at 13.45 on Monday, September 11th, 2017 and it will be followed by tea at the Nash Conservatory in Kew Gardens. The Fullerton family would love to see as many as possible of Lottie's friends on that day, so please pass on these details to anyone you think will want to come. The family has not yet said what they would prefer to be done about flowers but this information will be published here when it is known. The dress code for the funeral will be casual and the family has said that those coming should wear whatever they find comfortable. Click here for the report of the ​2015 Girls Under 21 Handicap Singles.